Perquin is a community of 4,000 people located in the North of Morazán, where Claudia Bernardi in partnership with Valeria Galliso have been artists in residence, educators, facilitators, organizers of art workshops and classes, directors of public projects, designers of art productions in Perquin and near by villages from the North of Morazán. Where do I begin, a hope, breathing from the escape of everyday, only art bringing a life to the creation in which we are, in what we breathe, in what we make. Words are a beautiful thing, but they are different from feeling, emotions are so vast within ourselves connected to all around that words can never grasp the fullness of a feeling. When we feel full inside of love, appreciation, admiration, the connections are so deep. Art is that outward expression of what we feel, it reaches at things that words can not, because image is vast in itself, a stroke, a picture, a color, watching the hand turn nothing into something beautiful is one of the most powerful things in this magical universe. I think of the smiles, the laughs, the wide eyes eager to learn, the warm hearts open to help each other, the patience, the timid confidence, the self-approving feeling of completion, this embodies art, with creation we break down barriers, we ease the energy, we collaborate ideas, we share our hands to create together to create in one, we advise, support and learn from each other. Art. Creation. These are the answers, as the earth cycle of destruction and creation, death and life continues in endless time, I continue to move towards creation, not alone, but with others, together, for it is strong that way, and as we create in communities we create unity, our hands becoming one working together for the same thing, completion. When I think of the canvas stretching projects I think of team work, I realize nothing in this world is done alone, we need each other, as independent individuals we live dependently to make a whole. As layer by layer the mural surfaced into a masterpiece of history, of hope, of the strength the people hold through hardships. History, the pain, the bloodshed that encounters the lives of so many, is hard to comprehend, why do some destroy as others create? The cycle comes to my mind again and I can only make sense of it all by thinking there must be a reason, we are here to learn, to look at the past and create a different pattern in which we involve ourselves in this world, interacting, projecting, out what we will in-return, receive. Perquin, a magical place, the warmth. The strength that permeates from the eyes of the elders, a silenced reservation that gives them an aura of power and intimidation. The humor, easy going-ness of the young adults, un-talked about unlimited work that exists in their blood and hands, but sealed with the want to enjoy life. The children, an innocence so pure and bright, they run freely, shouting , playing , laughing with each other, calling our names, living life that was not possible only 15 years ago. A war torn country in the process of building but not forgetting the past. Now they sit in seats, looking at their beautiful faces in a mirror, carefully drawing a curved line of the eye, the pupil deep in its experiences, a hairline there, the chin more rounded here, being proud, knowing they posses power within their hearts, within their hands. The skill amazes me, so naturally they can draw, so naturally they see the truth, modest some, proud others, all approving of each other, rain pouring and they all come. Claudia’s presence permeates the air, inspiring, modifying, encouraging, and creating. Love. It exists wherever we turn if we choose to see it; it is there, if we choose to create it, it grows. Art, we create art together we create and together we grow, we learn , we evolve, we take destruction and we plant seeds and together we cultivate through our minds our spirits our hands, we create. The kids run shouting,”Christina““Christina” little arms wrap around me, large eyes stare up with joyous smiles, a community with no excess, a community with very little materialistic pleasures, but a community richer than any I know. Filled with essence of what life is about. No one walked away until all was finished, every canvas was stretched together, everyone cleaned together, and everyone brainstormed together. This is rare when the imagination of one becomes two and three until the hemisphere is filled with the combination of minds as one, hands together, and we create life by living it together. Intelligence rolls of the tongues of these women standing in strength with the memory of their past still permeating what they do today. Weaving together they have a safe place, arms painting, building, mosaicing, we transform at a rate that has no time, while creation there is no time it is only the now, and in reflection we see the miracles of what art can do, not only physically, but internally, spiritually. I think of my life what I care for, from Perquin I confirm what for me is important in life, with family, food, love, education, working, struggle and growth, with art we can live not needing all that we are told into believing but knowing in our hearts what is really important. In life we create societies and communities, we choose to live together as humans, and we do this because it is our nature, we are meant to, but where we sometimes don’t finish what we started is then creating peace within these communities we have created. We can not just live near each other but separate, we must learn to live with each other creating dynamics that help the whole, where equality flows through every household, where our neighbors are our friends, and where we naturally work together, because we want to, because we just do. That is a community; that is Perquin. Peace is a possibility, we have the power to live in love, to learn, not to judge, but listen with an open mind, to teach and grow together and we will evolve. Perquin has taught me what community is, a genuine concern for the whole, for our people, walking together, strong, leaving no one behind, hearts sending together, creating a life for the betterment of us all. 12 years of civil war ravaged El Salvador, leaving death and poverty. Then came an unlikely Bay Area export, art—and hope. Perquin, El Salvador—Rigoberto Rodriquez, a farmer in his mid-30s, stares intently as he sketches a self-portrait with a pencil under a weak fluorescent light and the steady staccato of pouring rain. Claudia Bernardi, an instructor at the California College of the Arts in San Francisco and Oakland, then holds up Rodriquez’s self-portrait and showers him with praise. Perquin, a small mountain town in the northeastern Morazán state, is the former stronghold of the leftist Farabundo Martí National Liberation Front. The town is still known as the guerrilla capital and houses a museum dedicated to the rebel movement. From 1980 to 1992, El Salvador suffered through a brutal civil war that claimed the lives of 75,000 people. While many analysts praise the successive governments for bringing economic advances, 36 percent of the country’s nearly 7 million people still live in poverty. The “dollarization” of the economy in 2001 exacerbated the divide between the haves and have-nots, but made it easier to integrate into the economy the millions of dollars being sent from relatives living in the United States—16 percent of the nation’s gross domestic product in 2004. With such grinding poverty, one would think that art classes would be a low priority. But in several rural towns in El Salvador, Bay Area artists and students are making art an integral part of villagers’ lives. “I think that the legacy of the war—and the postwar—is that of sharing resources, of community partnership,” said Bernardi. Bernardi, a native of Argentina, is the director of the Perquin Art School and Open Studios. In the mid-1980s, she returned to her homeland to work for the Argentine Forensic Anthropology Team, creating archaeological maps of exhumations to determine crimes against the civilian population. She arrived in Perquin in 1992 to exhume victims at El Mozote, a small nearby town where hundreds of peasants and their children were killed by army troops in 1981. 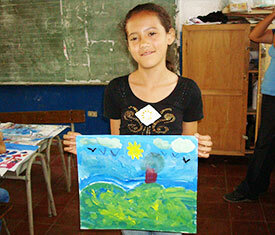 After a priest asked her to paint a mural in the church there, she returned to paint more murals in other towns. 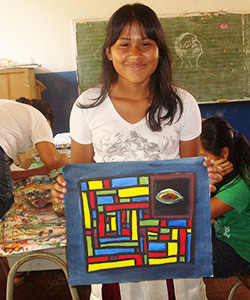 In 2001, Perquin’s mayor asked her to create an art school for the community. It took more than three years and the auctioning off of her work before she could raise enough money. The project began in March, including classes in photography, printmaking, mural painting and puppetry, with more than 70 children. Some students walked as far as 5 miles to attend class. In the sugarcane-growing region between the capital of San Salvador and the Honduran border, another group of Bay Area educators is also teaching art. Each summer for the past five years, the Colima Project of San Francisco State University has sent students to teach art classes to children and adults in the hacienda headquarters of a local sugar cooperative. Bay Area art students Amanda Eicher, Mike Harris and Ashley Gaos are working on a mural at a local school in which the students drew the figures and the artists helped draw them on the wall, wield brushes and apply the finishing touches. The theme and title, “Children to Study, Adults to Work,” is a tough proposition in an area where most children leave school to work in the fields. As her younger brother Gerzon tried to distract her, Griselda, 11, runs down the list of art projects she has completed in the past month: piñatas, maracas, clay masks and a sketchbook for drawing and painting. “I am happy when they are here and sad when they are not,” she said. Another student, whom villagers call Don Chepe, remembers the March day in 1980 when soldiers and guerrillas fought it out in town. Don Chepe said he survived by hiding with two other workers but will never forget what he saw. Twenty-one people were cut down within the hacienda, and another group was put in a truck and never seen again. Such events still color life in El Salvador, presenting the Bay Area artists with a challenge on how to engage students with their own history, and let art help them transcend it. Harris, a Castro Valley resident, spent his last evening in El Salvador with local children, climbing trees and horsing around. But for Bernardi, El Salvador is kind of an escape.